Sometimes you want something truly special. At Renegade Collars, we understand the desire to be unique and that’s why we offer our Bespoke Collar Services. These custom designed collars that are made 100% to your specifications. Everything from leather color to stud type can be customized. Once your description is received, our collar artist will then provide a price quote for you and. After the specifications and price are agreed upon, a concept illustration will then be created for you. You may then request changes if needed and, once your design is approved, an invoice will be produced for you. 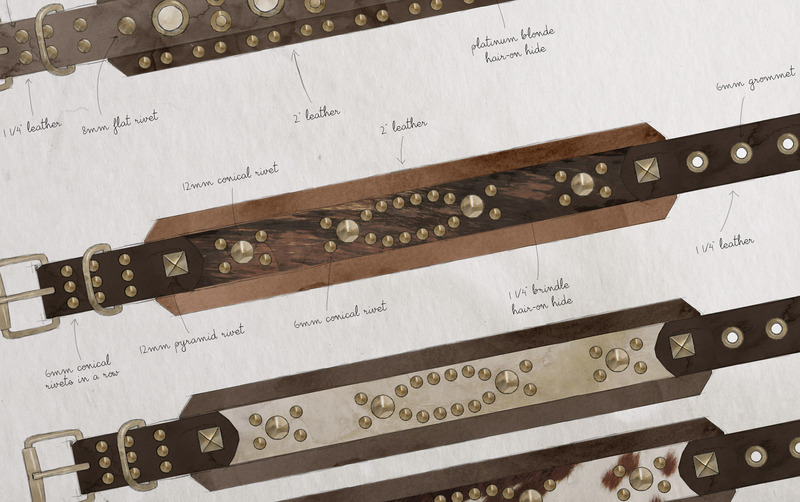 After payment is received, production will begin on your custom collar. To get started, simply fill out the form below! Let us know what you would like. Please be as detailed as possible and don't forget to include your pet's neck measurement, as this has a direct impact on the design of your collar. Do you have a rough sketch of what you would like, or a photo of your pet for color/coat reference? Please upload that, or any other reference image you wish to use, here. 10MB max file size.